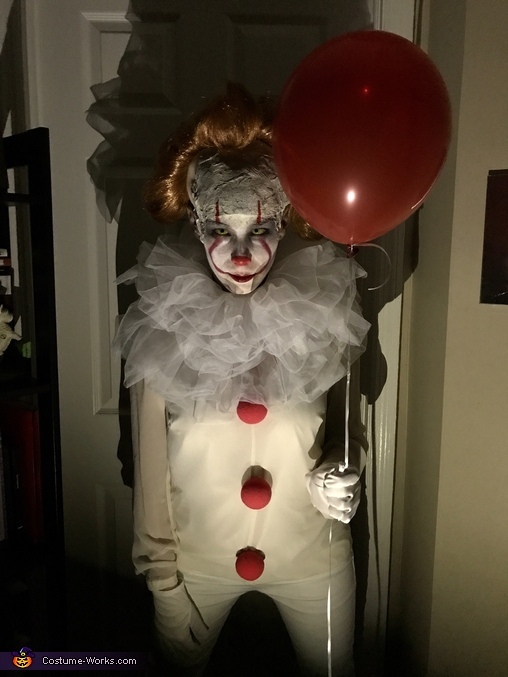 I decided to dress up as Pennywise to pay homage to one of my favorite stories from Stephen King. I put the costume together mostly from items I had at home. I wore white pants and a white blouse; I safety pinned three red balls down my blouse; I had a friend cut and sew a white tutu around my neck; I wore white gloves; I wore a bald cap and red wig; I wore yellow contact lenses. Once I put on the bald cap, I used liquid latex to adhere tissue paper to the bald cap and blended it to my head. I then did my own makeup. Oh, and, of course, a red balloon!